Best reason – my new column on nature and environment at Raleigh Public Record. Very good one: I have been documenting The Bain Project, posting like a madman at Raleigh Rambles. The Bain Water Treatment Plant has plenty of relevance for Raleigh Nature, as it used nature’s own filtering process – gradations of rock and sand – to clean water drawn from Lakes Raleigh, Johnson, Benson, and Wheeler. 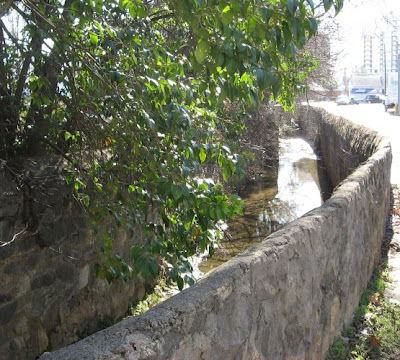 It and the more ancient pumping station which served as the city’s first water facility sit beside Walnut Creek (more about Walnut Creek below). Just behind the Bain facility is a wonderful greenway deck that traverses wetlands strewn with swamp mallow, huge white blooms that startle in a sea of southern green. Good news: I have more time now, being a teacher, and I also hope to bring Raleigh Nature readers some neat photos from our anniversary weekend in Charleston and our upcoming trip to Bar Harbor and Mount Desert Island. My promise is at the end of the post. 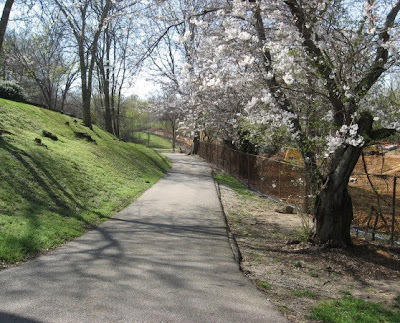 Lots of happenings around the greenways. The section that follows Walnut Creek parallel to Poole Road got flooded Tuesday June 16, along with Rose Lane and other roads near the creek. The NandO story about the flooding was being followed up the next day by Josh Shaffer, who I met walking Rose Lane when I went to photograph the high water on the greenway. He was hoping to chat with some of the folks who are stranded by high water once every year or so at this dead-end extension of Rose Lane across the creek. I remember quite well my teenage years when Rose Lane dead-ended into a meadow well short of the creek, because we used to drive down there to park in what seemed like deep country in the sixties. Whoever decided to build houses past a perennial wetland with no outlet is the real problem, but the curent residents are facing the consequences. Josh covers lots of interesting stuff for Nando, from Legos to beloved beer slingers to taking small children to play in cemeteries. 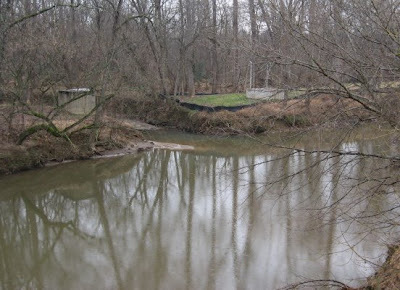 His recent story on kayaking Crabtree Creek really struck a chord, with its realistic description of the grit, mud and smells encountered on the creek, but I prefer the much quieter section of Crabtree above Lassiter Mill for canoe jaunts. 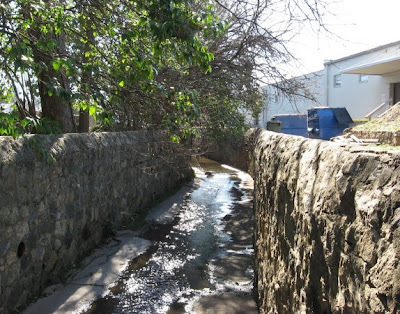 Getting back to poor Walnut Creek, the heavy rains that caused flooding also sent 15,000 gallons of untreated sewage into the creek upstream in Cary, but the Nando story said no fish kills had been reported. 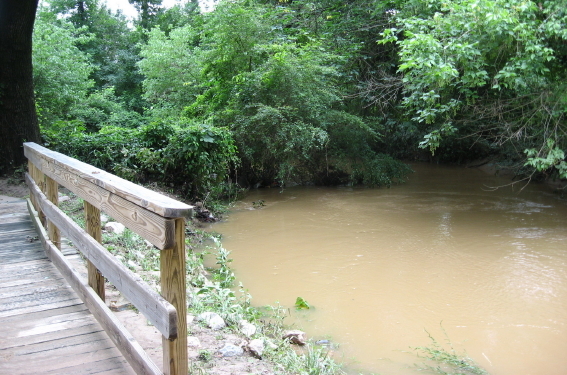 Newsflash from NandO: the 4 inches or so of rain also did damage at Yates Mill Pond, pictured above, which has temporarily closed the millsite and trails. Repairs are expected soon. 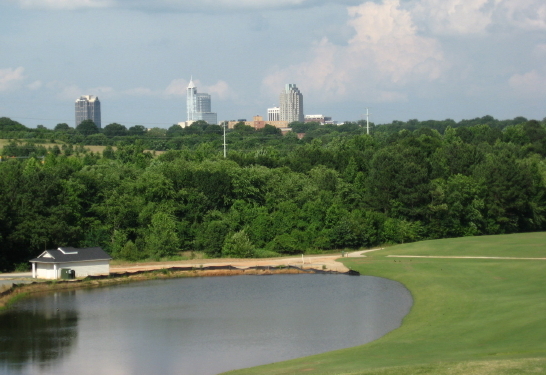 The new Lonnie Poole Golf Course around Lake Raleigh is mostly finished and expected to open in July. I posted dismal views and comments about this project in February 08, but when I stopped by recently I felt a little better. 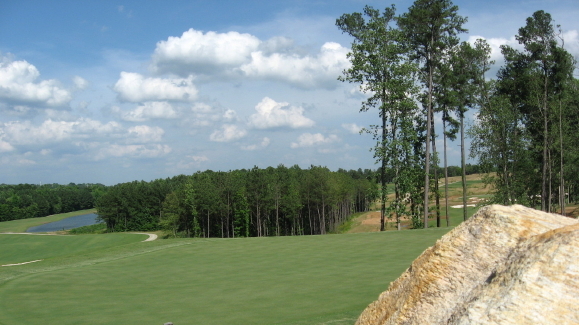 There are lots of wooded buffers, especially next to Walnut Creek, and I must admit the course is looking pretty. The Fletcher Park water garden is being fine tuned. Apparently the water level, though quite low down in the retention ponds, was too high for some of the plantings, so a crew came in and extended a kind of penisula of land into the lowest pool, as you can see below. The crew that explained this to me were taking survey sightings to appraise the work that had been done. 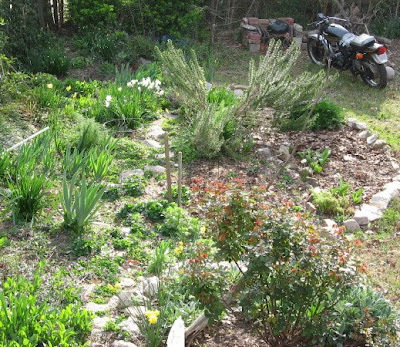 Many of the original plantings had been shifted to higher ground. The ponds still look pretty muddy to me, but I know time will do wonders. They had an opinion on one item that had been bugging me since the NandO article – springs. There are no active springs in Fletcher Park, just surface water from the neighborhoods and seep from the ball fields. 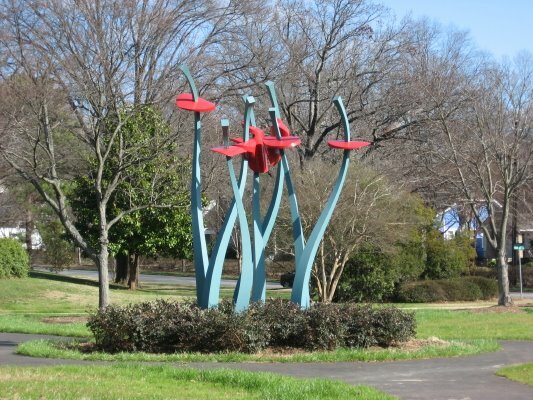 Fletcher Park’s lilies are in full bloom! There! All the nature news fit to post. I can’t promise any certain frequency of posts, but I promise to stay totally committed to getting fresh postings up about nature and wildlife inside or near the beltline. 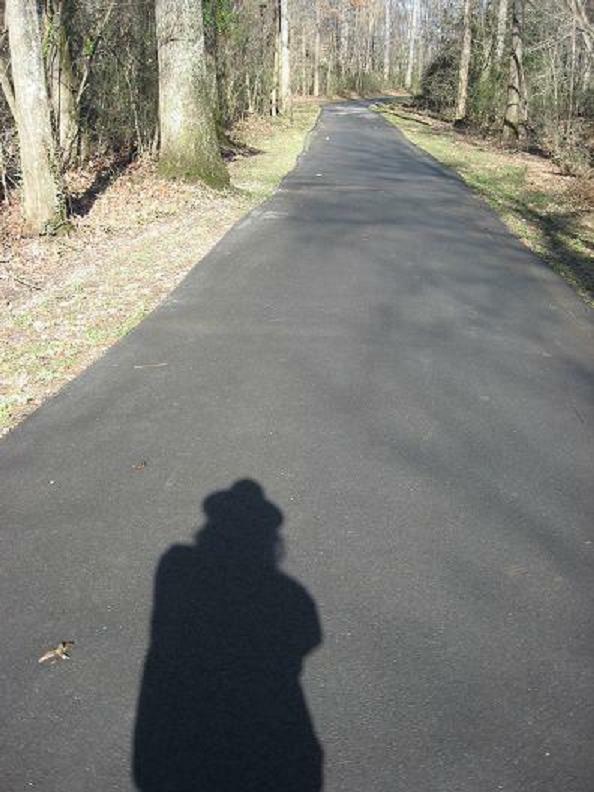 See you on the greenways! 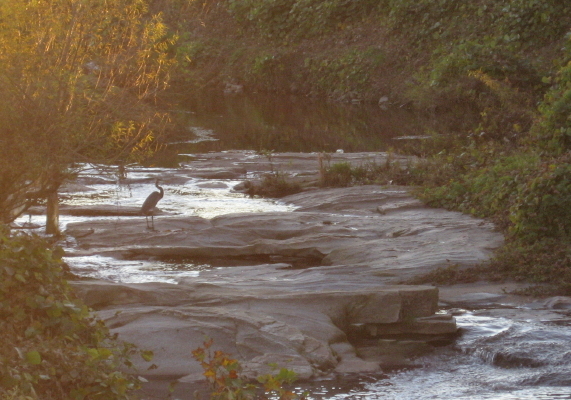 In our previous post, we began with the hidden headwaters of Pigeon House under Cameron Village, and followed it through the the Park Avenue neighborhood and down West Johnson Street to Peace Street, with a reach-out to Capital at Wake Forest, where the heron above (remember all pictures should click to enlarge) found a rocky spot of wilderness. This post backs up to Devereux Meadows and follows Pigeon House Branch down to its intersection with Crabtree Creek. An unhappy course, for the most part. The city is trying to rehabilitate it, one tributary at a time. Below is the map of their plan. Pigeon House Branch drains the northwestern quadrant of downtown, gathering water east of the Oberlin Road ridge, bringing it through a series of open stone culverts through the Park Drive neighborhood. At St. Mary’s Street it enters the Glenwood South business district and is piped under the roads and railroads tracks and down to Devereux Meadows. The dark blue line is where they want to uncover the creek, and the brown area is where the city wants to create a “Riverwalk” at Devereux Meadows. Below we see the creek as it begins its path through this area. Pigeon House Branch is under there somewhere! The creek escapes out a large pipe and continues down between West Street and Capital Boulevard. About here is where the 42 inch pipe pictured below delivers all the water collected from Fletcher Park and its $700,000 water park! Pigeon House crosses back and forth across Capital Boulevard, traveling through wide manmade ditches covered with kudzu. The water passes over the heron’s rock outcrop and turns northeast. It dives under Capital yet again and emerges at Watkin’s Grill, a venerable blue-collar breakfast joint at Old Louisburg Road and Atlantic Ave. 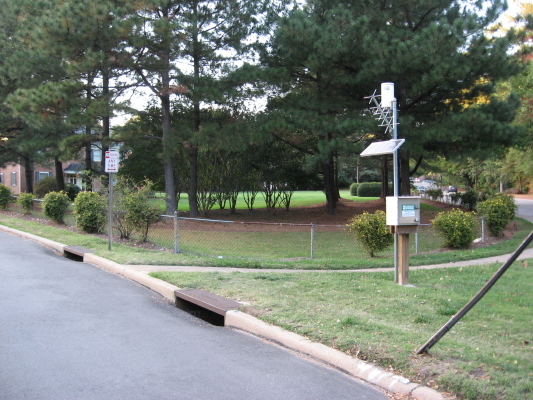 Traveling between the north and southbound lanes of Capital, it accepts the water from off the Blount St. ridge (Mordecai to Oakwood), and makes its way through successive parking lots, including Johnny’s Motel, Dunkin’ Donuts, The Foxy Lady and the bowling alley for over a mile, before turning east at Crabtree Boulevard. Here Pigeon House lends its seepage to a small marsh between it and Crabtree Creek. 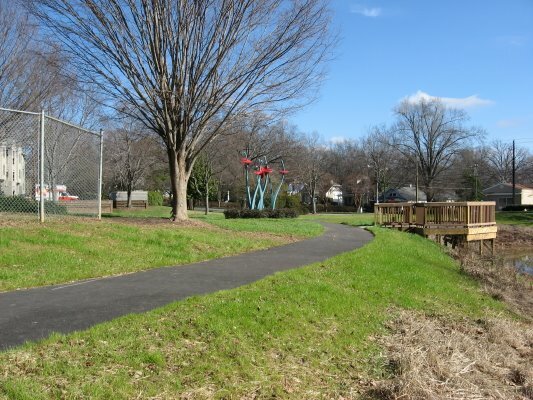 It feeds into Crabtree at Raleigh Boulevard, its mouth visible from its bridge over Crabtree as well as the nearby greenway deck. Pigeon House is decidedly urban and yet makes its way through former waste lowlands turned into thoroughfares, so its riparian buffer is actually less stressed for space than many other creeks in Raleigh. Thus the heron, thus the opportunity for a high-end greenway at the site where I watched many a minor league baseball game. Much hope can be found for success with the city’s project to rehabilitate Pigeon House Branch. This is a thorough sequence from Devereux Meadows to Crabtree Creek. John Dancy-Jones, a science teacher at Fletcher Academy, has been keeping up with the water garden on his blog at www.raleighnature.com. 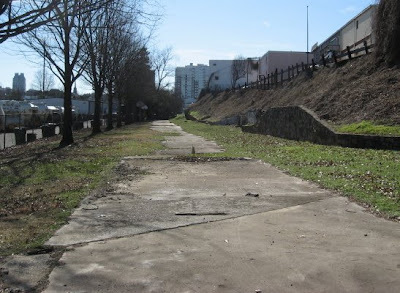 “The greenway path beside the water winds around and unifies what used to seem like a very bifurcated setting,” of the park’s upper and lower levels, Dancy-Jones said. The purpose of the water garden is to slow and filter the water being drained into Pigeon House Branch, down the hill at Capital Boulevard. Mr. Goldsmith did not quote me on my main reservation about the project, which is that our notoriously low water flow periods might render the ponds stagnant and perhaps slow to fill in the first place. He stated in a phone conversation that several springs had been discovered during the course of construction. I have high hopes for this water garden , but the photo below seems to show seeps rather than springs in the highest portion of the water garden proper. 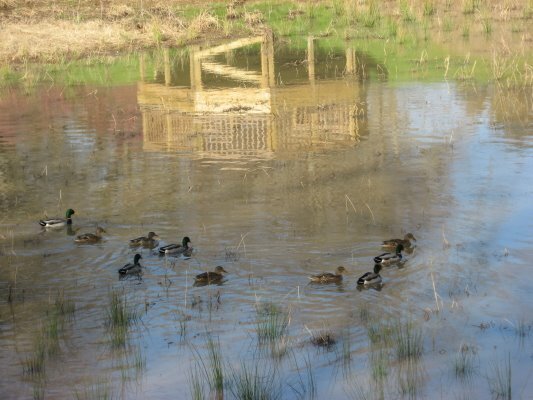 What Mr. Goldsmith does do is start his article with a wonderfully appropriate joke about residents of a new $710,00 residence (the mallards in the largest, lowest pond). Ironically appropriate because the need for this system, paid with mostly state and EPA funds, was created by the dense, impermeable developments right across the street from the park. 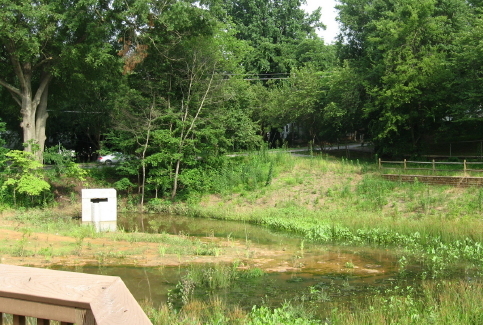 But if the designers accomplish their goal – a balanced wetwater ecosystem with rich food chains that keep down mosquitoes, then Fletcher Park can become a gem that represents a small scale model of what will probably happen in the end at Dix: development, and compensation for it that provides valuable amenities for all. The N&O article cites science evidence that the system is already benefiting Pigeon House Branch, and that waterway needs all the help it can get. Above, the expeditious mallards. Below, looking toward Glenwood. 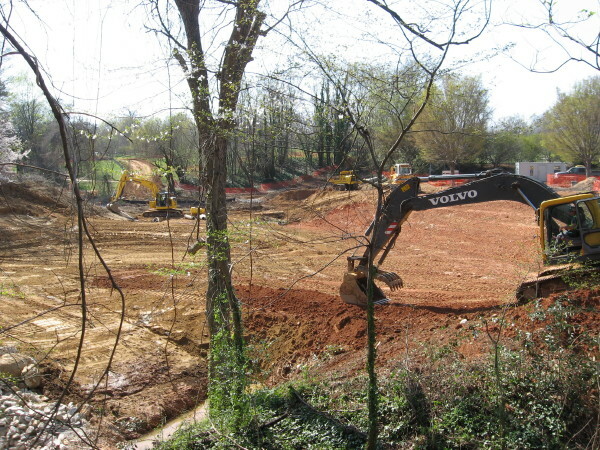 There is not a lot to update on the earlier post about Fletcher Park’s new water park, which remains in a distinctly unlovely stage of construction, but this project is interesting from several angles and seems worth another look. 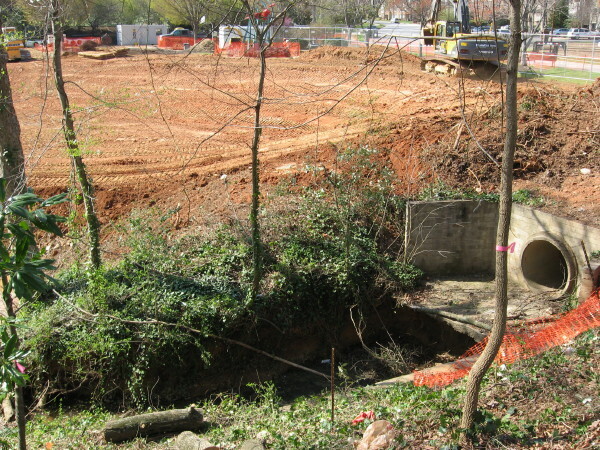 The large cavities being excavated from the red clay are designed to hold the water headed down to Pigeon House Creek, which is the long-suffering waterway that parallels Capital Boulevard as it flows north toward its intersection with Crabtree Creek at Raleigh Swamp. What look like huge pits will allow the water to deposit sediment and be filtered by plant activity before flowing on down the hill. A nice description of the benefits, which include hopes for “A new ecosystem for this area of the park [with] butterflies, dragonflies, and frogs, among other animal species, ” can be found at The Raleigh Connoiseur. But that post was in May, and the plan was for the water garden to be finished soon after. But there it sits. The upper pool shown below will cascade or slide down to the larger lower pool. This site was a Methodist orphanage, built in 1900 and still operating well into my lifetime. 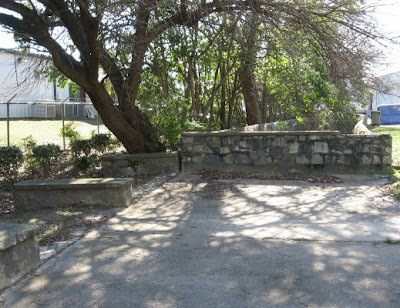 The City purchased the property in 1982 and named the park for A.J. Fletcher’s recreation-loving son. 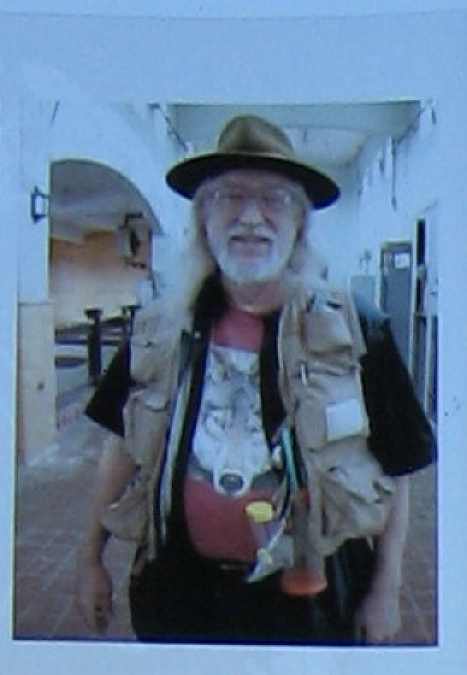 Fred Fletcher was inducted into the Raleigh Hall of Fame in 2007. The outlet seen above is the water’s exit toward Pigeon House Creek. From this point the water dives underground and is piped under the railroad line and across N. West Street. I cannot find a spot to view that intersection yet. Below is a picture of Pigeon House Branch just downstream. We will follow it’s grim journey down Capital sometime soon. 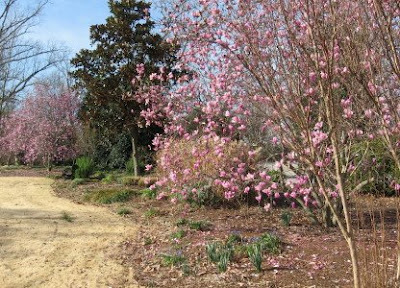 Spring Forward – erase your nature deficit! This post was originally published on March 23, 2008. The equinox on Thursday and the warm weather have us all thinking about getting out into the dirt – right? Maybe your kid doesn’t like to get out and garden with you. 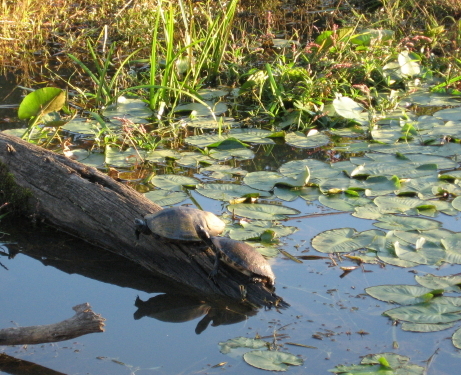 Consider sending them to the Green River Preserve this summer. This environmental camp for rising second through ninth graders, with expedition programs for all high schoolers, is located on several thousand acres in the Blue Ridge Mountains. They have an outstanding program. They also promote a book, Last Child in the Woods, by Richard Louv, which centers on a concept to consider: nature-deficit disorder, which can affect any of us if we’re not careful. Plant those seeds, take that walk, mount that expedition! Have a great one! The flowery driveway of a street that edges Fletcher Park. This time of year, it’s one of the prettiest sights in central Raleigh. You can glimpse the new construction on the right. More about that below. 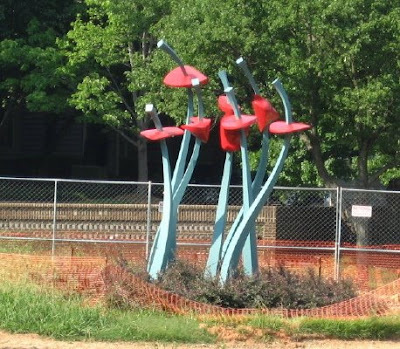 The Fletcher water garden project is really moving along and needs more coverage. 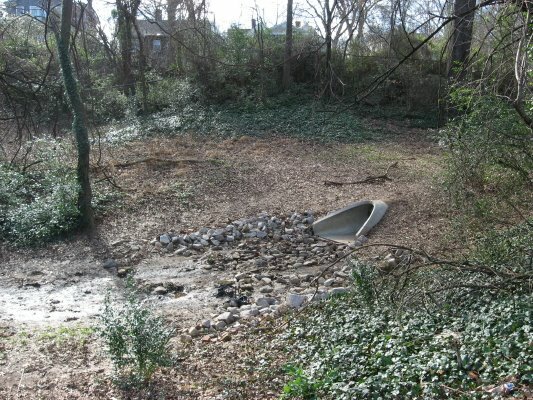 One of the primary functions of the water garden will be to capture, slow and filter the water from this drainage as it makes its way down to Pigeon House Creek, across the railroad tracks by Capital Boulevard. There are plenty of other tributaries to that troubled creek that need help more than this heavily wooded glen, but it definitely will provide some much-needed quality control. 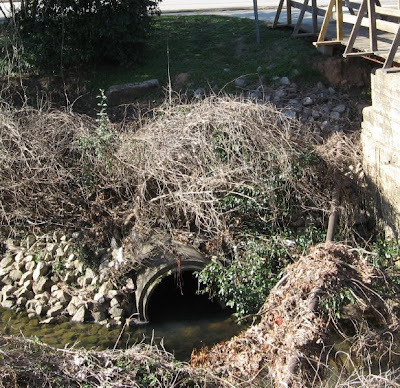 We will watch this project carefully, and use it as an entrance to the many issues surrounding Pigeon House Creek. 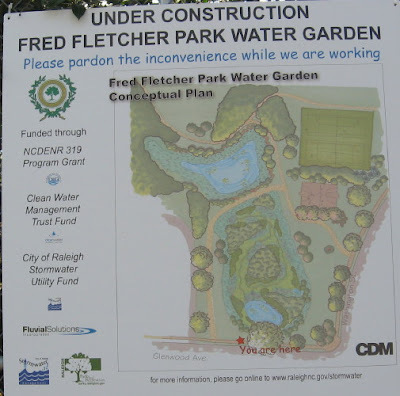 As well described at New Raleigh, a new water garden has been approved for Fletcher Park. This controlled, even manicured, piece of urban wilderness was a Methodist orphanage most of my childhood. Now it is a heavily used recreational area with a friendly hillside picnic area and a gorgeous, richly planted plateau overlooking a really intriguing amphitheatre. The south edge used to be more or less thickly shrubbed and ignored, but now the environmental model project will dress up and bestow structured access to that area. For now, it’s a mess, but it sounds nifty. Above, the flowering trees of the plateau and the amphitheatre. 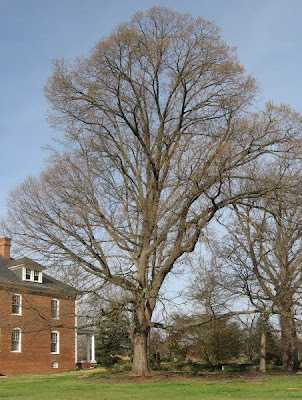 Below are two wonderful tree specimens that are nearby. 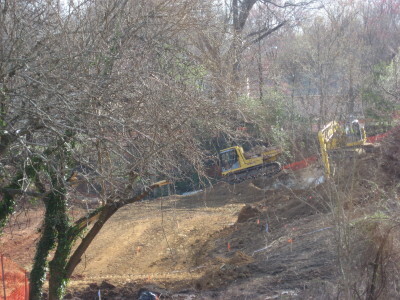 Last are two pictures of the water garden construction. 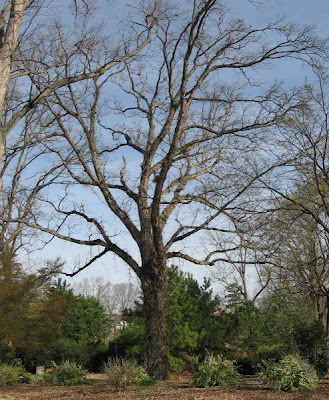 Above a red oak, below a white.